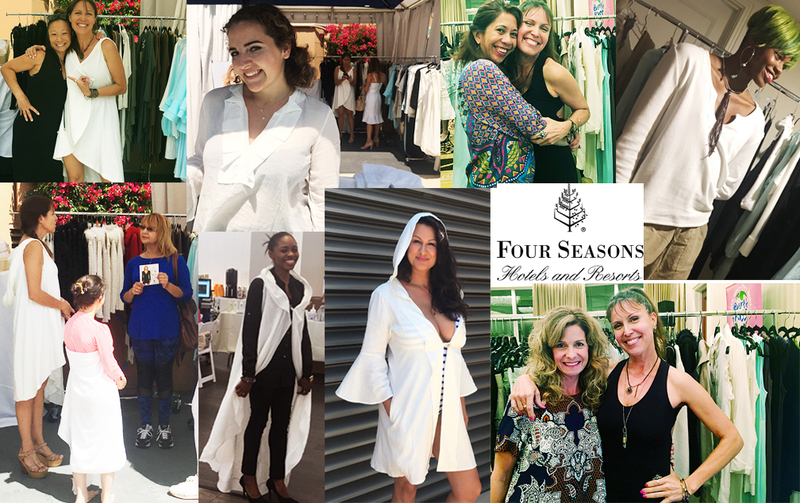 We are proud to have a very successful chain of pop-ups happening through some of LA’s hottest street fairs and resorts. Live events are always so good at capturing the energy and ethos of the brand, while at the same time being able to adorn women in beautiful clothing. People from all walks of life come to share in the beauty and happiness that these events create. It is all about bringing together some of the most fun and exciting fashion, beauty, arts & crafts, and food brands in LA. Our booth was filled wall-to-wall with our Mermaid Collection as well as a bunch of one-offs that we were playing around with in the workshop. Lots of our shoppers were excited to know that they were buying something one-of-a-kind. It’s always fun to sell one-off pieces that no one else has, and interact hands-on with the customer when showcasing unique pieces. While we were there, KTLA 5 approached us because they loved the energy and lively setup of our booth. They requested that SITA Couture join them on the lots to be interviewed for its company culture. KTLA got a sneak peek into SITA Couture: who we are, what we’re doing, and why we love LA fashion so much. One of the highlights of being a fashion brand in LA is that we have some of the best manufacturing and textile resourcing, as well as amazing fashion markets and runway shows that actively support fashion brands. The surrounding community, as well as close personal friends and business colleagues, are always willing to help us succeed. It pays to live in one of the five Fashion Capitals of the world.